Forget millennial pink: Designer Karim Rashid looked to good old-fashioned magenta in his latest project, the HAP 5 tower in New York’s East Harlem. 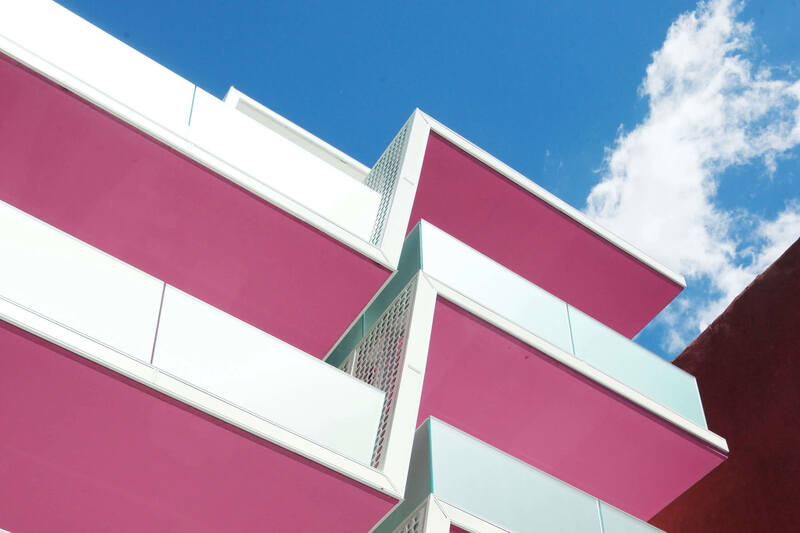 The project is an 8-story, 20-unit residential building whose modular, geometric facade features pops of Barbie’s favorite hue. When one looks up at the building against a blue sky, the structure takes on a kind of Op Art vibe. “We used the balcony as a design feature to generate dynamic play and variety along the façade,” explains Rashid. The balconies also feature glass railings which serve to refract the sunlight, casting rose-colored rays on the spaces within. “By offsetting the balconies from each other, we are left with a strong, angular geometry,” the designer says. “This pattern allows light and shade to play through the form and converts the enclosure into a soft, permeable trellis. In addition to these enviable outdoor spaces, the building, which is set just feet from the East River Plaza, boasts a roof garden with sweeping views of Manhattan. Looks like Barbie and Ken may have found a new apartment—even the address, 329 Pleasant Street, seems to suit them.